We’d love your help. Let us know what’s wrong with this preview of How NASA Builds Teams by Charles J. Pellerin. Every successful organization needs high-performance teams to compete and succeed. Yet, technical people are often resistant to traditional "touchy-feely" teambuilding. To improve communication, performance, and morale among NASA's technical teams, former NASA Astrophysicist Dr. Charlie Pellerin developed the teambuilding process described in "How NASA Builds Teams"--an ap Every successful organization needs high-performance teams to compete and succeed. Yet, technical people are often resistant to traditional "touchy-feely" teambuilding. 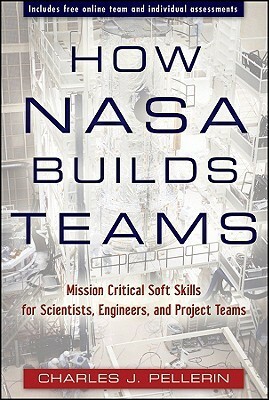 To improve communication, performance, and morale among NASA's technical teams, former NASA Astrophysicist Dr. Charlie Pellerin developed the teambuilding process described in "How NASA Builds Teams"--an approach that is proven, quantitative, and requires only a fraction of the time and resources of traditional training methods. This "4-D" process has boosted team performance in hundreds of NASA project teams, engineering teams, and management teams, including the people responsible for NASA's most complex systems -- the Space Shuttle, space telescopes, robots on Mars, and the mission back to the moon. How NASA Builds Teams explains how the 4-D teambuilding process can be applied in any organization, and includes a fast, free on-line behavioral assessment to help your team and the individual members understand each other and measure the key driver of team performance, the social context. Moreover, these simple, logical processes appeal strongly to technical teams who eschew "touchy-feely" training. Pellerin applies simple, elegant principles from his physics background to the art teambuilding, such as the use of a coordinate system to analyze the characteristics of team performance into actionable elements. The author illustrates the teambuilding process with entertaining stories from his decade as NASA's Director for Astrophysics and subsequent 15 years of working closely with NASA and outside business teams. For example, he tells how the processes in the book enabled him to initiate the space mission to fix the Hubble Space Telescope's flawed mirror. To ask other readers questions about How NASA Builds Teams, please sign up. Ugh. Here I thought this would be a book on the challenges specific to working with and managing technical teams, but it turned out to be just another generic "book supporting a consulting business", albeit one written by someone who used to work for NASA. Whoopee. The first few chapters invite us to visit their website and fill out some self-assessments (which looked vague and bullshitty), and plant the idea of doing regular assessments and (of course) working with this company's system and coa Ugh. Here I thought this would be a book on the challenges specific to working with and managing technical teams, but it turned out to be just another generic "book supporting a consulting business", albeit one written by someone who used to work for NASA. Whoopee. The first few chapters invite us to visit their website and fill out some self-assessments (which looked vague and bullshitty), and plant the idea of doing regular assessments and (of course) working with this company's system and coaches. The "4-D system" trademark reappears over and over. It turns out that it's just another variant of the "everyone is a colour" schtick - type As are orange and nurses are green, or something like that. Been there, done that, and there's nothing scientific there, nor is it more appealing to engineers than any other management BS. I think later in the book it gets into general common sense advice like "learn to compromise" and "give people credit for their good work" and "don't pass the blame", but I only skimmed all this because I have more interesting books to read. Space exploration was not easily accomplished. One failed attempt after another proved this was not a task for the weak. Dr. Charles J. Pellerin was blamed for "leadership shortfall". All because of a teeny, tiny, little mishap. Luckily, he was able to redeem himself by fixing the telescope. Thanks to this advancement, he decided to look into forming better team relationships. This was a very interesting book that included great tips for interacting with others. I think this would be especially h Space exploration was not easily accomplished. One failed attempt after another proved this was not a task for the weak. Dr. Charles J. Pellerin was blamed for "leadership shortfall". All because of a teeny, tiny, little mishap. Luckily, he was able to redeem himself by fixing the telescope. Thanks to this advancement, he decided to look into forming better team relationships. This is a good book, he teaches good techniques to deal with big and small teams, how to identify people with different potentials and how to put people with right variety of potentials in a team and set them for success. All that is ok, but there is just toooooo much of marketing about his organization and his services, tooooo much, it is worse than TV and youtube advertisements. I wish he had it under control, because we have paid money for the book, I did not get that in charity. The whole book just feels like self praise which is at least dubious when we take into account NASA as one of the least effective institutions out there. Whole social context assessment framework is simple at first, but gets unnecessarily complicated and various parts are in direct opposition to things stated before in the book. I would classify this as "Teambuilding for Engineers". Although the book has a wealth of data it didn't seem to connect to me on a personal level. The formula: write a book so you can promote your consulting practice. Some interesting insights, but really not worth it.